How smart/knowledgeable are you? How short-sighted are you? How susceptible are you to misleading rhetoric and ignoring a problem? 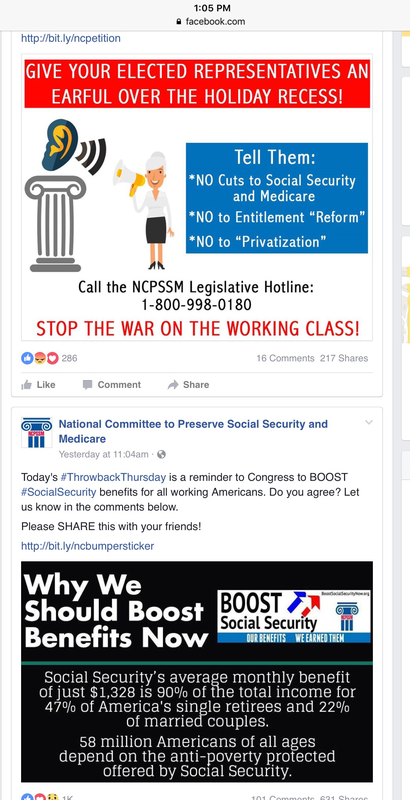 If you have read this blog for any period of time, you know that there are major problems with the cost and sustainability of both Social Security and Medicare. Changes must be made to keep them going and affordable, especially for younger generations. According to the Congressional Budget Office, Social Security is in worse shape than even the Trustees predict. The CBO says there must be a 31% cut in payment as soon as 2031; four years sooner and a larger cut than predicted by the Trustees. No reform, we just want bigger benefits while we are happy to ignore he fiscal facts. What a way to go? So why are so many Americans willing to jump on the bandwagon of sincere ignorance like the following? These memes can’t even get the math or spelling right. I do not use Facebook and I have read here how ignorant some of their posts have been and I must say it is truly amazing how wrong they are. I would go back to paper checks and make people sign a statement every time they cash the check on what was the original purpose of social security was and that it is not a retirement fund. If you do not have enough money, go back to work. But what truly worries me in your post is the CBO which usually has unrealistic budget projections is actually predicting the social security trust fund going broke sooner rather than later. These are the same folks who voted for Barack Obama (twice) and more recently, just finished voting for Donald Trump. Remember the “new, new deal” then-Senator Obama later President Obama promised? http://monthlyreview.org/2009/02/01/a-new-new-deal-under-obama/ That was a $850 Billion stimulus – the American Recovery and Reinvestment Act. Trump wants to “trump” that with a new $1 Trillion “infrastructure” bill – which will likely be financed with bonds, aka, more debt. Isn’t it clear why people believe politician promises …. it’s free stuff funded by people yet unborn. It is free stuff paid for by our children and grandchildren. I have not paid any federal income tax or SS tax since 2006. But my children have and will pay thousands each and every year. Also, my grandchildren will be paying into this ponzi scheme in just 13 years. Now Congress wants to cut taxes = more debt. They even want to cut the income tax on SS benefits of top earners, those who have more disposable income than any other age group. What a way to run a country.